Four years of drought and groundwater overdraft are causing the earth to sink faster in Central Valley, one of the nation’s prime agricultural lands. Recent damage in the lining of the Delta Mendota Canal, which delivers irrigation water to Central Valley Project contractors, is among many signs that land subsidence is worsening due to the area’s rapid decline in groundwater levels. New data from NASA’s Jet Propulsion Laboratory indicates than land near Corcoran in the Tulare basin has already sunk 13 inches in eight months, and one area in the Sacramento Valley was sinking at a faster rate (0.5 in. /month) than previous measurements indicated. While subsidence may have multiple causes (e.g., drainage of organic soils for agriculture leads to compaction and sinking), the most common is from over-pumping of groundwater. Subsidence occurs throughout California and it can increase the risk of flooding and damage pipelines, roads, and canals, for example. Past spending on infrastructure repairs due to subsidence was estimated at $1.3 billion. New repairs are expected to cost at least as much. As the sunken land cannot move upward even when groundwater levels are restored, the best way to address subsidence is to prevent the ground from falling further by recharging aquifers and tapping into alternative water supplies, such as through conservation and water reuse. Complications in the controversial Delta islands purchase have arisen due to pre-existing legal restrictions on how the islands can be treated. Metropolitan Water District of Southern California (MWDSC) is working with three Kern County agricultural water agencies to buy five islands in the Delta, currently used for farming. The agencies have expressed interest in engaging in environmental restoration as a means to improve existing water deliveries. The purchase may also help to boost the Twin Tunnels project as MWDSC is a project proponent and two of the islands are situated along the proposed tunnels route. The State Water Board releases proposed regulatory framework for extended emergency regulation for urban water conservation in 2016. Among key recommendations are an incorporation of a climate adjustment to reduce the conservation requirement of water suppliers in warmer regions by 4 percentage points, a baseline adjustment to account for water-efficient growth, and provision of credits to reduce the conservation standard if at least 4% of suppliers’ potable water comes from new drought-resilient supplies, such as indirect potable reuse of coastal wastewater or seawater desalination. NASA experts warn of destructive impacts of the “Godzilla” El Niño in early 2016. The latest satellite imagery suggests that the current El Niño may be more powerful than the strongest one ever recorded (the winter of 1997-98). The incoming storms offer hope of improved drought conditions, but their effects will likely be mixed as risks of mudslides and flooding will increase in some places. Recent study by Greg Asner and his team from the Carnegie Institution of Science reveals drought impacts on California’s forests over the last four years. Of the 41,000 square miles surveyed, almost 890 million large trees have experienced losses of canopy water, and nearly 60 million giant redwoods and sequoias are at risk of dying, which could lead to substantial and long-term changes in the ecosystems and biodiversity. As of December 29, drought conditions continue to improve with 10% of the state now under moderate drought conditions, an increase from 6.7% two weeks ago. 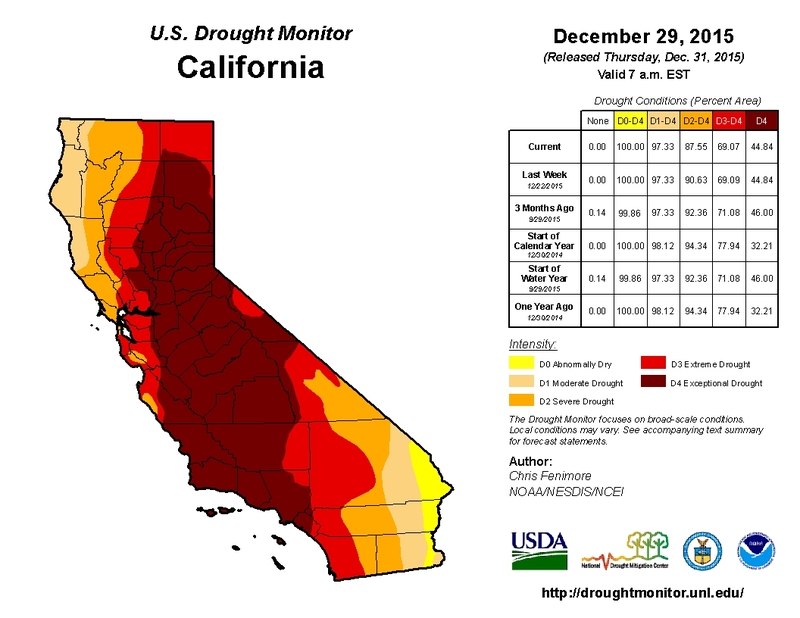 However, about 45% of the state still experiences exceptional drought conditions. Statewide snow-water equivalent average has increased to 10.2” or 105% of normal, as of December 30. 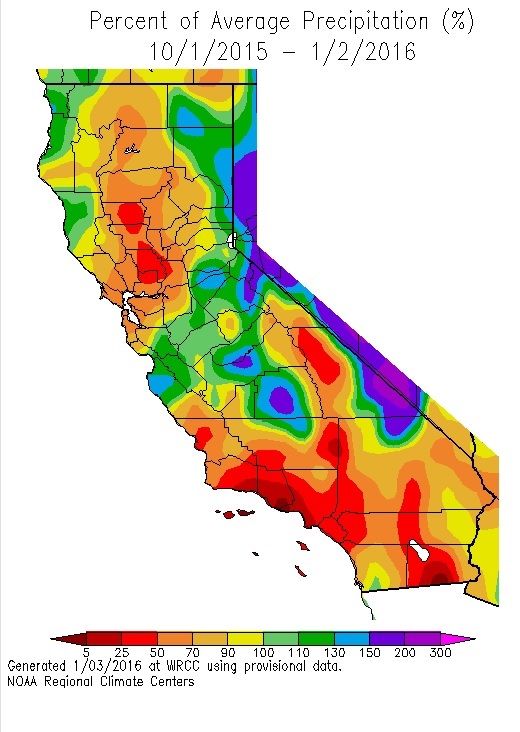 Central Sierra experiences above-normal snow-water depth at 116% of normal average, while it is 86% for Southern Sierra. 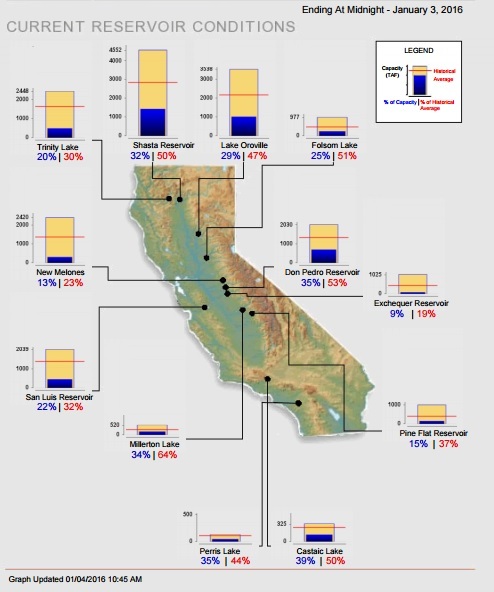 Water levels in California’s major reservoirs (representing 27.3 million acre-feet of storage) have increased slightly from 24% to 25% of statewide capacity and from 43% to 45% of group historical average. Current levels are about 70% of what they were last year. 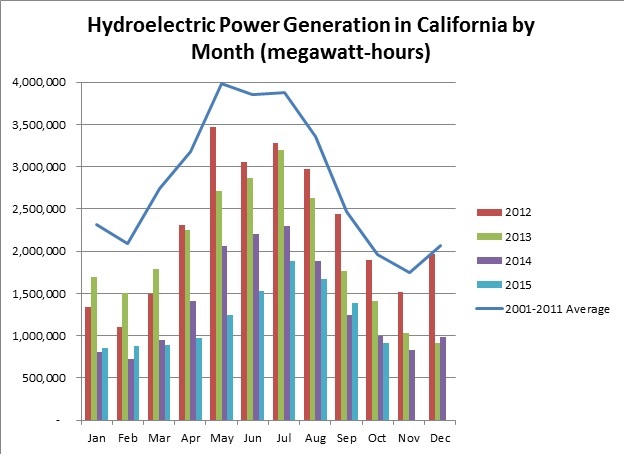 Hydroelectric power generation in October this year was 8% lower than in 2014, but 53% lower than the 2001-2011 October average.